Our get together started in Chapel Hill at the House which looked magnificent and hadn’t been seen by some of us in many decades. I was very impressed with the politeness of the current brotherhood as they kept addressing me as “Sir”. This was a little disheartening as I had convinced myself that with my youthful looks, I could almost be mistaken for a current brother. Our class group at the House was also impressed with the quantity and pulchritude (“beauty” for you non-English majors) of the coeds at the House. We all said the current brothers had no idea how lucky they were. We were at Carolina when the ratio of men to women was 7 to 1. Those are not good odds. 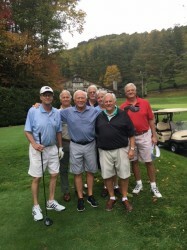 After the Chapel Hill stay, we headed to the beautiful mountains of North Carolina for some more bonding through golf matches, great stories, and wonderful dinners. Our first dinner was at Brother Jim Coleman’s house whose first words to me were “Adams, you look like you haven’t had a haircut since you left Carolina”. I actually took this as a compliment as another brother said, “At least he’s got hair”. At this dinner one of the nicest bonding experiences we had was Brother McChesney—an amazing historian—leading us through a look back at our fellow brothers. We had a 1966 Phi Delt composite photo of our class and three other classes—one older and two younger. 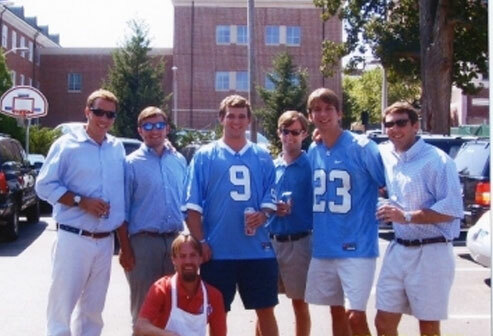 We went over most of the brothers in this composite and came up with stories on each—either what they had done since leaving Carolina or some memories of them while at Carolina (a number involving food fights). During this bonding period we also had “organ recitals” where we talked about our various surgeries, health issues, and current aches and pains. One brother had so much work done in his past, we dubbed him “Bionic Man”. Our drug of choice during this reunion was Advil. Turns out none of the brothers here use Viagra. Unfortunately, the reason for this: We can’t remember what to do after taking it. We played golf for two days on two beautiful golf courses. These guys are pretty darn good golfers—one brother has had 9 holes-in-one and another has had 2 holes-in-one on the same hole (he almost got another on the day we played that hole). As an awful golfer, I was happy about the format—Captain’s Choice—where I didn’t have to hit my own ball. Unfortunately, Brother Bell (the rules maker) changed the rules at the last minute and said each team must use at least one drive from each player on the front nine and the back nine. I immediately needed some Imodium. Ironically, my team used three of my drives, one of which was almost my first ever hole-in-one. What a special time sharing with friends we had lived with during four of the best years of our lives. Every class should arrange a reunion sometime within the next several years. Call Steve Bell (336.232.1905) if you want to utilize the Phi Delt house or secure a block of hotel rooms in Chapel Hill.